This PDF 1.4 document has been generated by Microsoft Word - feb2009pageone / ÿþS c a n S o f t   P D F   C r e a t e !   , and has been sent on pdf-archive.com on 10/08/2017 at 22:16, from IP address 104.145.x.x. The current document download page has been viewed 249 times. File size: 1.3 MB (10 pages). 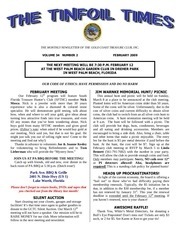 March 8 at a place to be announced at the club meeting. Planted items will be American coins older than 50 years. Bennett (561-791-7682) with the number in your party. This will allow the club to provide enough coins and food. required! This is a standing club policy for planted hunts! 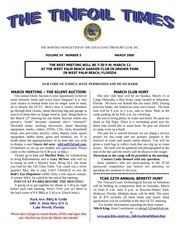 follow in the next meeting and newsletter. you haven’t renewed, now is your chance! each, or 2 for $5. See Karen or Ken to get your tix! sell for $450. Call 561-694-7963.
sdeLuc823@aol.com / call 561-687-2310 for more info. NEW 4.28.08; used ONCE for 2 hours. MINT Condition! Excellent competition hunter! Must Sell! Sacrifice: $485. Ken Lubinski to buy your copy! expenses at the Great Southern Beach Shootout in April. charge. Sometimes ads will need to be edited due to available space. so, be sure to buy YOUR tickets at our next meeting! bring refreshments. THANKS A MILLION, Mindy! donations of cigar boxes and a ring mandrel. perception of our hobby! Way to go, gang! birthday month. Happy Birthday, gang! organization thanking him for returning the lost item. Medic Alert provided a prepaid envelope. Gary also received a reward. metal detect there was after a bush hog had been used. horse show ring. Bob Dobski found 5 horseshoes. Hopefully they will bring him luck for the rest of 2009! applications will be available at the GCTC meetings. application forms will be available at the next meeting. had people thank me for covering my holes. you, they talk, and they like to tell what they hear. SO? at Lake Worth Oceanside Market for Saturday, Feb. 28.
looking for volunteers who can help and participate. Here is what we are looking to do that day. kinks. Your suggestions and support are welcomed. fun PR event. John Lobota - Mobile: 561-628-2629.
coordinated through Bascom Palmer Eye Institute. compassionate patient care and innovative vision research. otherwise would not be able to afford corrective lens. attended. One flew in from Oregon. caution. Wearing orange clothing was recommended. Also, we had to keep an eye out for panthers. cheesecakes was brought in from Baton Rouge, LA. One cheesecake must have weighed at least 10 pounds! Director of Major Gifts; Stacey deLucia, VP, GCTC; Dr.
Terrence P. O'Brien, Professor of Ophthalmology; Dr.
Brian Haft, Fellow to Dr. O'Brien. Lubinski won the grand prize - a conquistador helmet. display case made by Sniffer (Dennis) from Kansas. McDonald House. Please SAVE yours and give to Jan! and sunglasses for the Lion’s Club of South Florida. donate! Don’t let all that digging go to waste! goes to the right place! Thanks to everyone who helps! was a closer match! Congrats, Tom! expected. Come to one meeting or come to all. This file has been shared by a user of PDF Archive. Document ID: 00638831.